Hi there! It’s Jess and Stacie from The Real Food Dietitians, a popular blog and website that focuses on healthy eating with real food. We’re delighted to share with you the reasons we think quality matters when it comes to dairy and why we always recommend organic and grass-fed dairy. With the recent popularity of the paleo diet, plant-based eating, and the Whole30, we’ve seen dairy products slowly disappearing from shopping carts everywhere. Even on our own blog, we share many dairy-free recipes specifically for those following these types of eating plan, but we also believe in the benefits of incorporating high-quality dairy products into the diet when they are well tolerated (i.e., in the absence of allergies or sensitivities that have been identified through testing and/or an elimination diet protocol). We define high-quality dairy as that which is first and foremost organic and from cows that are treated in a humane way. 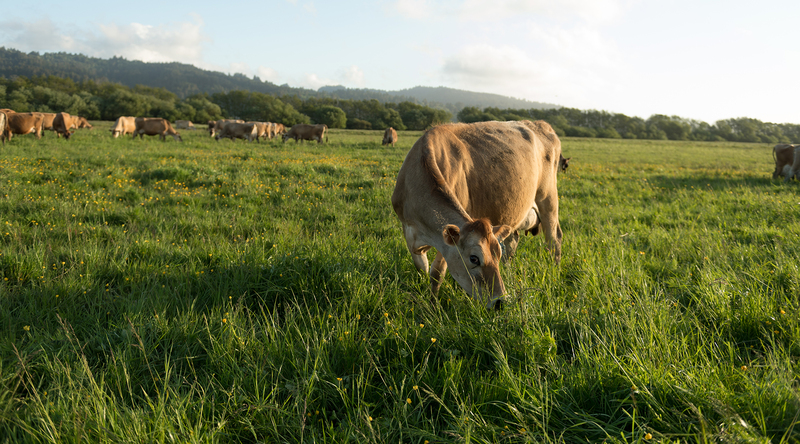 Going beyond organic, we believe that milk and dairy products from cows that are 100% grass-fed (raised solely on a diet of grass and dried forages), are allowed to graze throughout the grazing season, have year-round access to the outdoors and space to roam is the gold standard when it comes to dairy. Cow grazing in lush pasture. Organic dairy cows must be allowed to graze on pasture during the grazing season. Feed and forage provided to organic dairy cows must be certified organic, which means free of pesticides, herbicides and GMOs. No antibiotics*, growth-promoting hormones or steroids can be used in organic dairy cows. Holistic management techniques are the first course of action when it comes to prevention and treatment of illnesses. This reduces the risk of antibiotic-resistant infections to both the cows and humans. Milk from organic dairy cows is healthier thanks to its higher concentrations of omega-3 and conjugated linoleic acid (CLA) essential fatty acids. As we mentioned earlier, we are big supporters of organic dairy and believe that grass-fed dairy is even more superior in terms of taste, nutrition and the health of the animals and the environment. So what is grass-fed dairy? It’s dairy made with milk that comes from cows fed a diet of grass and dried forages like hay. To be truly "100% grass-fed" these cows must not receive any corn, soy or other grains during their lifetime. 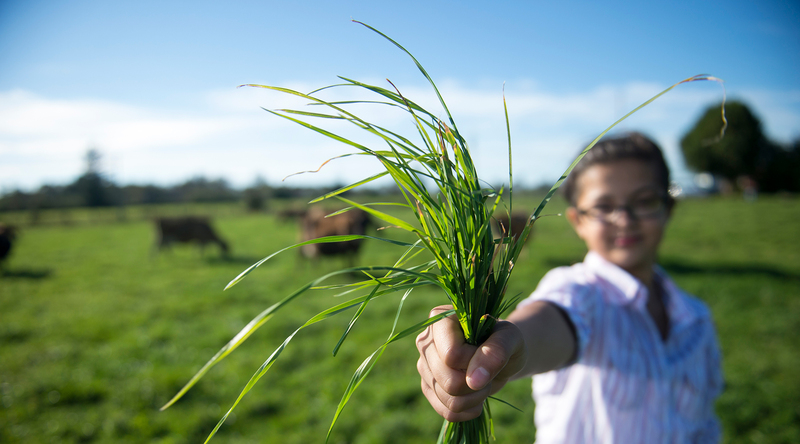 Young girl holding handful of green grass. For the cows: Cows are happiest and healthiest when they eat the diet nature intended for them – grass and forages. Their multi-compartmented stomachs are capable of digesting grain, and it’s a high-energy food, but grain to cows is like sugar to humans: they can eat it, and it tastes good, but they do much better with less. For the environment: When cows are allowed ample room to roam and graze on grass, they naturally leave behind "deposits" of manure that are rich in nitrogen, an organic compound that is necessary for soil health. Healthy soil produces healthy forage (grass), which in turn feeds the cows and helps prevent soil erosion. Grass-based agriculture also cleans the air by pulling carbon from the atmosphere and storing it in the soil. Due to the recent popularity of grass-fed dairy, there has been some "greenwashing" with regard to products labeled grass-fed (both dairy and meat). “Grass-fed” could mean the animal received anywhere from a little to a lot of grass in its lifetime. Unfortunately, there are no universally accepted rules governing the use of this phrase**. To help you navigate the sea of labels out there, look for products labeled "100% Grass-fed," head to the product’s website to check out their frequently asked questions (FAQs) or contact the company directly (contact information can be obtained from the package or by visiting their website). The bottom line is that quality matters more when it comes to dairy than it does for most other foods in our book. (Organic meat and poultry are also important for the same reasons we recommend organic dairy.) For those who tolerate dairy and choose to include it in their diet, high-quality, organic and grass-fed dairy offers superior nutrition for your family while helping promote the health and wellbeing of the animals and the land they’re raised on. 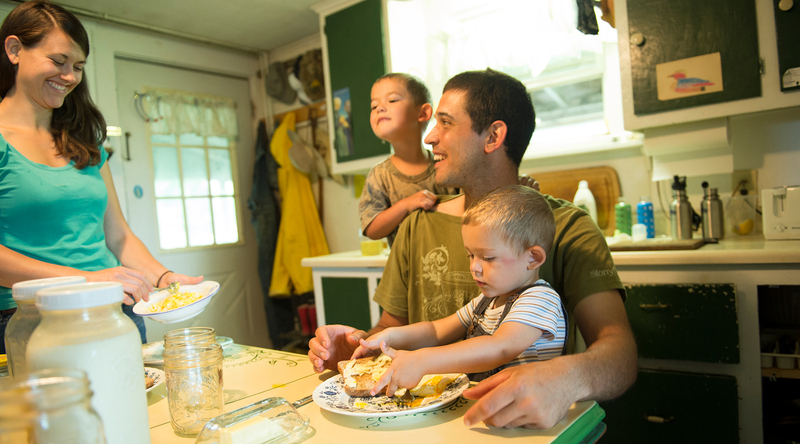 Young family gathered around the kitchen table. 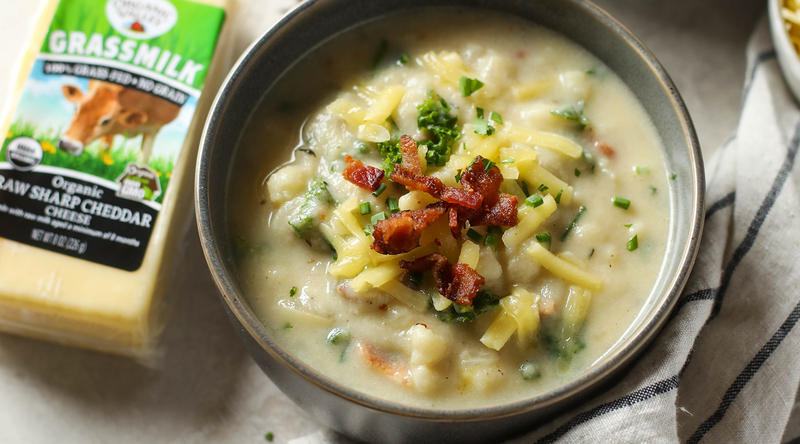 We think this Loaded Cheesy Cauliflower Soup featuring Organic Valley Extra Sharp Grassmilk Cheddar is the perfect way to enjoy the benefits and taste of grass-fed dairy. A bowl of Loaded Cheesy Cauliflower Soup using Organic Valley’s Grassmilk Cheddar, topped with bacon crumbles. Image credit: the Real Food Dietitians. * The only exception to this rule is the National Organic Program requires antibiotics to be used to prevent undue suffering, but if used, the animal must be removed from the organic herd. ** But a “100% Grass-Fed Organic” standard is in the works! Rootstock will share more information when the details are announced in a few months.